Tackling hate crime and prejudice is the driver behind a new campaign planned by local authority bosses in Northern Ireland. Derry City and Strabane District Council will work with an agency to deliver its Cohesive Neighbourhoods Minority Inclusion communications activity over the coming three years. The £46,000 communications element is part of a wider programme of at least £110,000 worth of work aiming to go beyond token efforts to include minority ethnic, LGBT and disabled people, as well as political ex-prisoners and victims of the Troubles. The project is being funded by money awarded through the €270m Peace IV Programme 2014-20, an initiative from the European Union designed to support peace and reconciliation in the region. An anti-prejudice campaign and community and educational resources are the primary elements of the communications work, and the council’s plan is to cover sectarianism, racism, homophobia and transphobia, as well as wider hate crime. Social media is expected to run alongside more conventional communications approaches, according to the council, with the campaign due to begin on 1 December 2017, and run for up to three years. Working with the community will be paramount for the project. Derry City and Strabane District Council explained that the successful agency must work collectively with a cross-community dialogue group. Together, the agency and the dialogue group will suggest, agree and deliver an anti-prejudice social media campaign, as well as conventional media approaches and a community and educational resource. A Derry City and Strabane District Council spokesperson said: "In terms of measured direct impact on participants, the work must be effective in improving tolerance, respect and celebration of cultural diversity. "It should improve attitudes towards cross-community and cross-border activities, decrease prejudice and improve capacity and confidence of the participants in addressing sectarianism and racism, as well as positively influencing wider attitudes within their community. It should also increase their sense of belonging and involvement in civic life and local community." The communications aspect of the programme is being put out to tender alongside work on strategy and sustainability, with 10 minority groups assisted through support and cross-community training sessions. Meanwhile, a separate element of the programme is an inter-cultural pairing project, with at least five minority groups paired with five groups from the wider community to learn about each other’s culture, identity and unique challenges. The project will culminate in a celebration event, and the successful bidders for each aspect of the programme are expected to work together to avoid overlap. The agency running the communications work will take an overall co-ordination role, including setting up a project steering group, which will become the key point of contact for all involved. 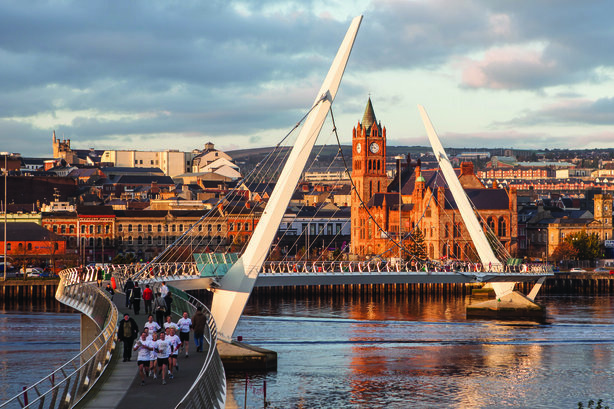 Derry and Strabane is currently bidding – along with Belfast – to become the European Capital of Culture 2023, with in-house comms experts working with agency MCE Public Relations to handle the area’s pitch. Derry-Londonderry was previously the UK City of Culture in 2013, and the city is the second largest in Northern Ireland, behind Belfast. Agencies can bid for the anti-prejudice campaign work until 20 October.